The Club House is a great place to exercise, to relax in the pool or spa or, to play a game of tennis. This beautiful community facility can also be reserved for private gatherings. It's equipped with a barbeque grill, plenty of indoor space, a kitchenette, a dining area and a large-screen television with ample seating. Plan your group get-together at the Club House! 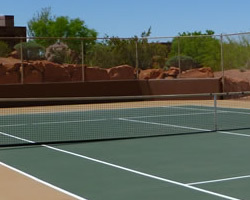 The tennis court is available to book through our booking app. In the fitness center you'll find great equipment including a Bowflex, running treadmill, elliptical trainer, bicycle machine as well as free weights. 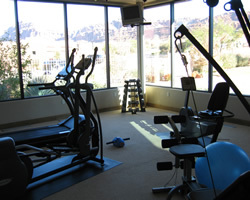 The fitness center is available on a first-come first-served basis. The pool and spa are available to residents and guests of residents only. Entry is gained by using your Homeowners Use Pass key. Please carry your homeowners Use Pass key when using the pool and/or spa at all times. 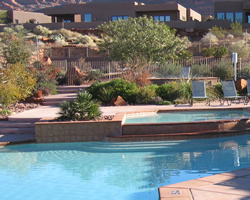 The Cliffs of Snow Canyon is a member community of the Entrada at Snow Canyon Country Club. 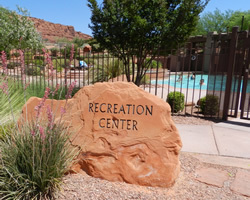 Please click here to be taken to the Entrada website.